The Lean Management Certification for Services (LMAC-Service) shows administrative and service industry professionals how to achieve sustainable improvement in organizational performance and capability. Co-developed by Productivity Inc. and The Ohio State University for senior and middle managers, the Lean Management Certification for Services (LMAC-Service) is a highly competitive, interactive program that teaches a carefully structured series of Lean concepts and techniques as applied specifically in services. Our combination of classroom discussion, group exercises, simulations, case studies, and hands-on application lets you transform theory into reality and educational lessons into practical experiences. Lean Management Certification for Services (LMAC-Service) develops Lean transformation managers, not simply project managers. Over three non-consecutive weeks, participants experience a series of learning modules focused on defining current state, deploying Lean methods, and developing a culture of improvement. Between training weeks, participants apply Lean principles in processes at their own organizations and present their progress and results to the class during subsequent training weeks. Gain the know-how, confidence, and problem-solving skills you need to drive waste from your processes and boost enterprise-wide performance. Perform as principal change agent. Lead organization-wide improvement tied to strategic goals. Assess the current state, establish baselines, and determine remedial actions. Create detailed transformation plans based on a value stream perspective. Guide, mentor, and coach project managers, department managers, and team leaders in the use of specific improvement tools and methods. Designed for senior and middle managers looking to drive waste from their processes to boost enterprise-wide performance and improve customer service. Cut accounts receivable process time by 33%. Increased quotation capacity by 40%. Reduced IT support action item closure time by 25%. Reduce accounts receivable and accounts payable labor cost by 30%. Implemented a direct communications program to continuously broadcast company DNA. Reduced product development quotation time from ›3 to ‹1 day. Reduced Design Engineering time-to-market from 224 hours to 50 hours. Shortened the product engineering order processing time from 17 days to 8 days. Reduced invoicing process time from 22 hours to 8 hours. Cut the ordering processing time for key customer components by 60%. Reduced global sales order quotation and order entry process from 10 days to 3 days. Month-end trial balance (closing) from 5 days to 2 days. New product launch from 55 days to 15 days. Reduced customer pricing revision procedure from 77 days to 2 days. Sales order through engineering design and pre-trial process reduced from 5 days to 1 day. Fully accredited certification for managers and leaders since 2001. A unique educational opportunity offered jointly by Productivity Inc. and The Ohio State University’s Fisher College of Business. “I learned a tremendous amount during this course. All my expectations were exceeded. To qualify, all participants must have a management sponsor, who will attest to the results achieved in on-the-job assignments. Participants must be affiliated with a manufacturing or service organization actively pursuing process improvement techniques, and should have a fundamental understanding of TPM and lean techniques. Participants who successfully complete the four-week training and mentoring program, pass the certification exam, and demonstrate successful implementation in their own facility are certified by Productivity Inc. and the Fisher College of Business as TPM Managers and earn 16 CEUs. Productivity Inc. is a leading consulting and training firm that helps organizations build new capabilities, save money, and grow. We focus on three progressive strategies: Operational Excellence, Innovation Systems and Leadership Development. Working together, these strategies provide the means to continually refresh a company’s value proposition while making the organizational changes needed for daily improvement and sustainable growth. a uniquely comprehensive approach to implementing Lean across an entire enterprise, incorporating assessment, leadership, and business renewal. More than simply a Lean consulting firm, Productivity Inc. can provide you with a variety of methodologies to keep your enterprise in motion™. Since 1916, The Ohio State University’s Fisher College of Business has produced exceptional leaders who meet the challenges of a changing global business environment through creative and effective solutions. As a result, Fisher’s reputation continues to rise and is reflected in rankings which place the college among the top 15 Business Schools in the nation at the undergraduate and graduate levels of public universities. Today, Fisher College of Business Executive Education continues to provide growth opportunities to business professionals seeking to increase their knowledge, insights and intuition. Their executive-level degree programs are comprehensive, integrative and examine today’s issues from every angle to give you a total business perspective. A block of rooms is being held for Productivity Inc. LMAC attendees at The Blackwell Hotel on The Ohio State University campus. Address: 2110 Tuttle Park Place, Columbus, Ohio 43210. Productivity Inc. attendees receive a reduced rate of $145.00 per night, single or double occupancy. Rate includes hot buffet breakfast. Please call 614.247.4000 or toll-free 866.247.4003 for reservations, and identify yourself as a Productivity Inc. LMAC program attendee. The special rate will be available until four weeks prior to the event; after this date the hotel cannot guarantee availability. For more information on The Blackwell Hotel, please visit www.theblackwell.com. 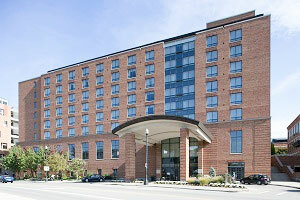 The hotel is approximately 8 miles from the Columbus International Airport. Prior to the start of the session, registrations may be transferred to a colleague without charge. To be considered for a refund, we must receive notification of cancellation in writing no later than 30 business days prior to the event. Cancellations received within 30 business days of the start of a program are subject to the full registration fee; this money will be held on account for up to one year for use at a future workshop or conference. Cancellations received within 10 business days of the start of a program will be assessed a fee equal to 20% of the registration fee; the remainder of the fee will be held on account for up to one year for use at a future workshop or conference. If no notification of cancellation is provided, registration fees will be forfeited. There is a $200 processing fee for all cancellations. No refunds or credits will be issued once a session is underway. On rare occasions, circumstances may make it necessary to cancel or postpone an event. We encourage attendees to book refundable/reusable airline tickets. We will not be responsible for incidental costs incurred by registrants. Note: All registrant applications will be evaluated for acceptance into this program. Graduates will be certified by Productivity Inc. and the Fisher College of Business at The Ohio State University as a Certified Lean Manager (CLM) and will earn 12 Continuing Education Units (CEUs). Consultants and university faculty may not be eligible to attend.